For those serious about getting the best media for their money, look no further than Microboards' line of DVD+R Dual Layer media—superior, high-performance media with an exceptionally low error rate that can be used for either video or data recording. Record up to 8.5GB at a speed of 8X and still receive the ultimate in playback performance and compatibility. Choose from silver lacquer, white inkjet, or white Everest printable surfaces. 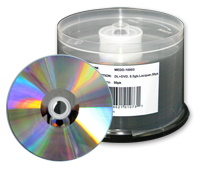 Dual-Layer DVD+R media is available in spindles of 50 discs. This page was updated Tuesday, January 18, 2011 at 1:37pm by Microboards Marketing Department.